A break in the nursery trial calendar gave the opportunity for a number of open trials to be held over the festive period. Richard Fawcett judged the entry of 38 at the annual Christmas Eve charity open held at Caton. Over a good sized course which dipped gently in the middle, the running was on Lonk hoggs. Running at eight, Richard Hutchinson and Sweep earned 90 points, a score which was not matched and took the title, two points clear of runners-up Katy Cropper and Zac. The money raised for a local charity amounted to £190. On the same day, Norman Ireland judged the entry of 30 at the Holmrook open. This sizeable course had a deep dip in the middle, had two fetch obstacles and three obstacles throughout the right-hand drive. Worked in fours, the Texel cross hoggs were reasonable to manage. With a morning run, Thomas Longton set the standard with his nursery dog Oz, gaining 86 points. They stood top until, at 25, Arthur Temple and Floss matched their score and, with better out-bye work, took the title. A morning run by Tom Rome and Jack won the novice class on 78 points. The trial held at Holmrook last Thursday (December 29) attracted a larger entry of 66 dogs, judged by Athol Clark. Running was over the same course and on the same Texel cross hoggs. At 53, Sergio Perello had the winning run with Murguia Jim with 94 points. This was their seventh win in their first open season. In good form, Sergio took a second win on New Year’s Day at North Lancashire with his other open dog Rap. Running near the end, Ross Watson and Ricky were second with 93 points on an out-bye decision over Willie Welsh and Cap on the same score. At the annual Boxing Day Charity open held at Clough Head, Philip Mellin judged the entry of 44. Gently rising to the lift, the course had a long right-hand drive and cross drive and was set over rough ground. Although this was the first time they had been used in a trial, Cheviot hoggs were reasonable to manage. At 20, Shirley Cropper and Danny had the winning run, gaining 74 points. Frank Cleary matched their score with Billy, at 30, to take second place on an out-bye decision. Proceeds from a raffle, auction, catering and entry fees amounted to £710, which was donated to the Air Ambulance. At the fundraising trial for the 2017 English National held at Worlington, Dennis Jenkins judged the entry of 40. All dogs had a fresh packet of Blackface hoggs, which were quite testing over the flattish course. Claire Neal’s Blake handled them with the care they required to take the title on 89 points, two clear of runners-up Megan Jenkins and Ember. More than £200 was raised. At the New Year’s Eve charity trial at Barford Meadows, where £220 was raised for the Wildlife Trust BCN, Tim Foster judged the entry of 35. Over a gently undulating course, running was on packets of four hoggs, mainly two Hebrideans and two Manx. Although reasonable on the course, sheep were quite tricky to pen. An early run by Ben Smith and Ben set a good standard of 92. A little later, Val Powell and Cully earned the top open score of 93, while, with a late run, Mark Banham and Belle took second placing on 92 with better out-bye work. Angie Blackmore’s score of 89 with Ren won the novice class and fourth placing in the open. CHARITY OPEN, Hollin Head Farm, Caton, Lancaster (Judge, R. Fawcett, Hardraw) Open (38 ran) 1, R. Hutchinson (Littledale) Sweep, 90 of 100; 2, K. Cropper (Shap) Zac, 88; 3, S. Perello (Caton) Murguia Jim, 87; 4, M. Longton (Quernmore) Rooten Brook Mac, 86; 5, S. Perello Rap, 84; 6, P. Rigby (Skelsmergh) Nell, 83. Money raised for St John’s Hospice, Lancaster, was £190. HOLMROOK, Cumbria (N. Ireland) Saturday open (30 ran) 1, A. Temple (Holmrook) Floss, 86 of 90 OLF; 2, T. Longton (Quernmore) Oz, 86; 3, A. Temple, Whiterose Flint, 85; 4, J. McRobert (Tweedsmuir) Nell, 84 OLF; 5, B. Dalziel (Ettrick) Cap, 84; 6, T. Longton, Maya, 84. Thursday open (A. Clark, Kirkby Stephen, 66 ran) 1, S. Perello, Murguia Jim, 94 of 100; 2, R. Watson (Millom) Ricky, 93; 3, W. Welsh (Dalmellington) Cap, 93; 4, C. Taylor (Keasden) Jess, 92; 5, P. Ellis (New Hutton) Joe, 91; 6, P. Ellis, George, 91. BOXING DAY Charity Trial, Clough Head, Grane Road, Haslingden, Lancashire (P. Mellin, Oakworth) Open (44 ran) 1, S. Cropper (Deerplay) Danny, 74 of 90 OLF; 2, F. Cleary (Barnacre) Billy, 74; 3, N. Vyas (Wigston) Todd, 73; 4, C. Kempson (Cowpe) Fleet, 67 OLF; 5, J. Harkin (Co Donegal) Norris, 67; 6, S. Perello, Rap, 66. Money raised for the Air Ambulance was £710. FUNDRAISING Trial for the 2017 English National, Worlington, Suffolk (D. Jenkins, Shadwell) Open (40 Ran) 1, C. Neal (Wormegay) Blake, 89 of 100; 2, M. Jenkins (Themelthorpe) Ember, 87; 3, R. Hutchinson, Jock, 83; 4, C. Taylor, Jess, 76 OLF; 5, S. Perello, Rap, 76; 6, C. Neal, Dexter, 75. Money raised amounted to just more than £200. NEW YEAR’S EVE Charity Trial, Barford Meadows, Kettering, Northamptonshire (T. Foster, Creaton) Open (35 ran) 1, V. Powell (Cold Ashby) Cully, 93 of 100; 2, M. Banham (Chipstead) Belle, 92 OLF; 3, B. Smith (Wytham) Ben, 92; 4, A. Blackmore (Ledbury) Ren, 89; 5, A. Blackmore, Del, 88; 6, K. Addington (Kettering) Drift, 86. Novice, 1, A. Blackmore, Ren, 89. Money raised for The Wildlife Trust BCN was £220. TARNWATER, Meadow Court, Tarnwater Lane, Ashton with Stodday, Lancaster (D. Harrison, Selside) Open (48 ran) 1, D. Scrimgeour (Wigton) Lyn, 95 of 100; 2, J. Scrivin (Elslack) Gwen, 94; 3, R. Hutchinson, Big, 92; 4, T. Longton, Maya, 91; 5, W. Bell (Earby) Slick, 90; 6, R. Fawcett, Lola, 88. NORTH LANCASHIRE, Lee End Farm, Quernmore, Lancaster (R. Watson) Open (64 ran) 1, S. Perello, Rap, 88 of 100; 2, R. Fawcett, Lola, 86; 3, M. Jenkins, Ember, 85 OLF; 4, T. Huddleston (Caton) Udale Ola, 85; 5, R. Hutchinson, Big, 83; 6, A. Temple, Jan, 82. WEST COUNTRY, Holsworthy, Cornwall (J. Summers, Tintagel) Maltese cross (18 ran) 1, T. Rofe (Chilla) Dot, 53 of 70; 2, J. Watson (Postbridge) Spot, 52; 3, J. Nicholls (Buckland Brewer) Sam, 49 OLF; 4, J. Watson, Huthwaite Roy, 49. Driving (11 ran) 1, C. Worgan (Chulmleigh) Lee, 76 of 100; 2, D. Heard (Cornwall) Tan, 67; 3, M. Evans (Holsworthy) Ben, 56. New handler (6 ran) 1, C. Watson (Bittaford) Flow, 57 of 70; 2, R. Skelly (Wotter) Midge, 51; 3, R. Skelly, Lex, 48; 4, R. Skelly, Coles, 38. BOB HAMBLETON Memorial, Slacksdale, was postponed; new date yet to be decided. January 7. FYLDE Nursery, Hollinhead Farm, Caton, Lancaster, LA2 9NA, 9.30am start, enter on field, those running two dogs must be booked in by 12 noon. HOLME Nursery, change of venue to Deerplay, Bacup, Lancashire, OL13 8RD, 9am start, enter on field, those running two dogs must be booked in by 12 noon. NORTH WESTMORLAND Nursery, novice and new handler, Croglin, Newbiggin, 9am start, enter on field by 1pm, for three dogs two by 12 noon, novice confined to Cumbria. NORTHERN Nursery, committee novice and new handler, change of date, Pool Tree, Hamsterley, Co Durham, DL13 3QW, about one mile east of Woodland, 10am start, enter on field by 2pm, three or more dogs first by 12 noon, only one after 1pm. NORTHUMBERLAND League, nursery and new handler, Chathill, NE67 5AA, 11am start, enter on field. RYEDALE Nursery, West House Farm, Kildale, YO21 2SE, between Kildale and Westerdale, 10am start, enter on field by 1pm, more than one dog first by 12 noon. SLINDON Open, Slindon House Farm, Slindon, Eccleshall, Staffordshire, ST21 6LX, 8.30am start, entry closed, catering. January 8. CHARITY Open, Hardraw, Hawes, North Yorkshire, DL8 3LZ, on the Askrigg Road at turning to Buttertubs Pass, 8am start, enter on field, maximum two dogs per handler, proceeds to Bone Cancer Research Trust. HIGHER WHITLEY Nursery, novice and beginner, School Lane, Higher Whitley, Cheshire, WA4 4QB, 9am start, enter on field by 12 noon. ROMNEY MARSH Cradle, nursery and novice, Whitehall, Ludgate Lane, Lynsted, Sittingbourne, Kent, ME9 0RF, 10am start, enter on field, catering. WEST COUNTRY Nursery, driving then MX, South West nursery qualifier, at Victor Pitts, 10am start, enter on field. 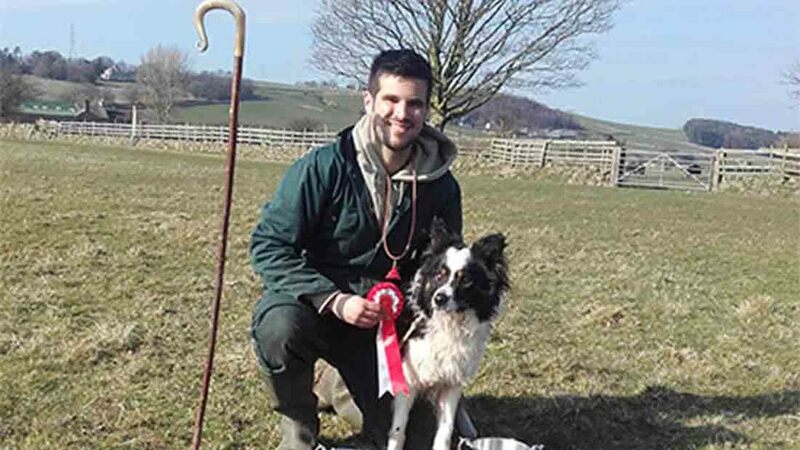 WINDERMERE Nursery and new handler, Whitbeck, Cumbria, off A595 about one mile north of Silecroft, 9.30am start, enter on field by 2pm, unless dogs are still competing. January 15. KEASDEN Open, Wickworth Cottage, Keasden, Clapham, North Yorkshire, LA2 8ET, 9am start, pre-entry, limited to one dog per handler, first 30 dogs, contact C. Taylor, tel: 07812 589 621. GOOD close work with touchy ewes gave Willie Welsh’s Joe the edge at Patna. Mule ewes were light and touchy at the pen, reacting against too much pressure on the flat course, which rose at the far end. Mr Welsh’s Joe was tight at top, but sheep stayed settled. A good fetch followed, but the turn round Mr Welsh’s feet was not neat. The drive started well, but ewes were low at the cross drive gate and made a wide turn through. A good pen, with only a minor break and a clean shed, completed the run. Julie Hill took the top two places at Roslin, with Glencregg Gael and Lee, respectively. Cheviot Mule hoggs were good to handle on a good sized flat field, with a long, testing nursery run. Gael ran out well, but lifted hastily and the fetch was slightly off line. The drive started well, until sheep tried to swerve the gate. Gael put them through and had a good cross drive. The hoggs went slightly off line on the return to the pen, but a clean pen and good shed secured success. A good run with only minor points lost at various elements gave Mosse Magnusson’s Nell the lead at Ardormie open trial. The packets of four easy care hoggs behaved well on the rising course, which afforded good viewing to spectators. Nell ran out clean to the top, but had to bend the line a little from the lift to the fetch. The fetch went well from there and the drive was nearly clean. A good pen and clean shed completed the winning run. NEWTON STEWART (Judge, W. Anderson, Newton Stewart) Nursery (10 ran) 1, S. McCrindle (Palnackie) Zak, 95; 2, C. Armstrong (Archbank) Malta Scott, 91; 3, I. McMillan (Newton Stewart) Rob, 90; 4, A. Stewart (Lockerbie) Kemi Ruby, 81; 5, C. Caygill (Whinnyliggate) Tag, 75; 6, D. Mitchell (New Luce) Kate, 71. PATNA (S. Rae, Patna) Nursery (13 ran) 1, W. Welsh (Dalmellington) Joe, 84; 2, K. Donald (Dalrymple) Alf, 82; 3, J. Shennan (Barr) Tess, 81 Outbye; 4, I. Fergie (Straiton) Rock, 81; 5, W.J. Welsh (Beoch) Tommy, 80; 6, A. McCulloch (Dalmellington) Risp, 79. ROSLIN (C. Smart, St Boswells) Nursery (12 ran) 1, J. Hill (Heriot) Glencregg Gail, 92.5; 2, J. Hill, Lee, 88.5; 3, R. Henderson (Crawford) Roy, 86; 4, D. Wallace (Blyth Bridge) Tess, 82; 5, R.B. Henderson (Heriot) Bonnie, 81; 6, M. McTeir (Moniaive) Jim, 80. Novice (9 ran) 1, S. Morgan (West Linton) Jill, 87; 2, K. Blackwood (Sanquhar) Jill, 75.5; 3, J. L’Etang (Slamannan) Gyp, 74; 4, J. L’Etang, Slip, 73; 5, A. Walker (Hamilton) Lass, 72; 6, D. MacDiarmid (Glenrath) Sally, 65. ARDORMIE (A. Wilkie, Lintrathen) Open (40 ran) 1, M. Magnusson (Mid Derry) Nell, 94; 2, P. Martin (Glenlyon) Jill, 92; 3, I.M. Brownlie (Bridge of Cally) Lia, 91 Outbye; 4, W. Welsh, Cap, 91; 5, P. Martin, Jen, 90 Outbye; 6, A.D. Carnegie (Comrie) Linburn Rook, 90. BETTYKNOWES (N. MacDonald, Shawhead) Nursery (9 ran) 1, A.R. Mundell (Moffat) Rob, 83; 2, D. Aitken (Lockerbie) Tweeddale Nell, 80; 3, D. Aitken, Tweeddale Fly, 65; 4, R. Malcolm (Gatehouse) Mac, 57. Pro-novice, 1, D. McMillan (Carsphairn) Craig; 2, D. Aitken, Tweeddale Buzz. THE Bromsberrow Heath Christmas Trial last Tuesday and Wednesday (December 27 and 28) saw two excellent days of trialling. Sheep worked well on the tricky course with its steep banks and the 300-yard outrun provided a stiff test. On the first day, Nigel Watkins took the top spot with Groesfaen Fern (Fly) and the novice prize went to Kevin Evans with Ace. On day two, Jed Watson won with Gwydr Zac and Nigel won the novice with Fly. At the Tynwern trial last Wednesday (December 29), the Lleyn sheep held well at the top of the field. An outrun was possible to either side of the gently sloping course. Sheep worked well, but were difficult to pen. Kevin Evans and Preseli Ci won the first session with a high-scoring run, which lost them only six points. In the afternoon, John Wheaton and Ben, who was running in his last trial before retirement, had the top score with only eight points lost. The Tirmynydd Charity Fun Trial, held in memory of Mike Hall, took place under floodlights on the evening of last Friday (December 30). There were 34 runs and a large crowd of spectators. The event, which was the idea of young handler Logan Williams and his family, was successful in raising £800 for Llandovery Cottage Hospital League of Friends. Sheep worked well over the short course, which included a pen and a single. Despite the fact a fine mist affected visibility for several of the runs, standards were high. Mr Evans and Preseli Ci’s score of eight points down gave them their second win of the week. BROMSBERROW HEATH, Day one (Judge, T. Griffiths) Open national, 1, N. Watkins (Llanddeusant) Groesfaen Fern (Fly), 93; 2, M. Capes (Lydney) Kinloch Cloe, 92 OLF; 3, S. Harden (Pembroke) Bob, 92; 4, N. Watkins, Tanhill Alex, 91 OLF; 5, K. Broad (Llanllawddog) Kinloch Levi, 91; 6, A. Driscoll (Llanllawddog) Kinloch Mazi, 90. Novice national, 1, N. Watkins, Groesfaen Fern, 93; 2, A. Price (Llandrindod Wells) Jill, 90; 3, C. Ridge (Narberth) Blue, 88; 4, M. Jones (Maesybont) Nan, 87. Young handler, L. Williams (Salem) Ned. Day two (R. Smith) Open national, 1, J. Watson (Yelverton) Gwydr Zac, 95; 2, K. Evans (Libanus) Preseli Ci, 94 OLF; 3, K. Evans, Ace, 94; 4, D. Howells (Post Talbot) Nip, 93 OLF; 5, J. Bowen (Tenby) Roy, 93; 6, J. Watson, Joe, 92. Novice national, 1, K. Evans, Ace, 94; 2, D. Millichap (Port Talbot) Milly, 90; 3, N. Matthews (Tredegar) Mali, 96; 4, C. Gordon (Gower) Maid, 84. TYNWERN, Open national, session one (A. Owen) 1, K. Evans, Presesli Ci, 6; 2, N. Watkins, Tanhill Alex, 11; 3, P. Tomkins (Llandrindod Wells) Foxridge Roy, 12; 4, A. Driscoll, Kinloch Pippi, 15; 5, J. Wheaton (Port Talbot) Ben, 16; 6, J. Evans (Swyddffynon) Scott, 18. Session two (V. Morris) 1, J. Wheaton, Ben: 8; 2, I.B. Jones (Capel Bangor) Tim, 9; 3, K. Evans, Ace, 10; 4, J. Price (Aberystwyth) Sam, 15 OLF; 5, S. Harden, Bob,15; 6, A. Owen (Corwen) Roy, 16. TIRMYNYDD CHARITY FUN TRIAL (S. Lewis) 1, K. Evans, Preseli Ci, 8; 2, S. Holt (Libanus) Hybeck Blake, 10 OLF; 3, R. Ellis (Nantymoel) Sweep, 10; 4, A. Driscoll, Kinloch Mazi; 5, K. Broad, Kinloch Levi, 10; 6, L. Williams, Ned.